The ODD Gallery is pleased to present Guns ‘n Ammo, a two-person exhibition of paintings and drawings by Ufuk Gueray and Dana Holst. Curated in-house, this exhibition brings together two distinct artists as an experiment in visual conversation. Working from different conceptual, thematic and stylist approaches, Gueray and Holst share an interest in the role of social investigation in creative practice as well a clear dedication to creating, developing and rarifying their own unique visual language to embody their inquiries. Pairing these two very different artists together, Guns ‘n Ammo looks to highlight not only their individual talents and artistic practice, but also the inevitable crossing readings, digressions, synergies and disconnections of the duo-show format. For Guns ‘n Ammo, Gueray presents six new oil paintings on mylar, completed during his five weeks as Artist in Residence at the Klondike Institute, and two recent silk-screen prints. The works confront the viewer: fields of garish colour, uncanny spatial and gravitational configurations, and moments of pictorial dissolution where, at times, the artist’s own use of thickly applied paint threatens to breach not only the imagery itself, but also the entire two-dimensional plane of his chosen medium. Similar tension arises from Gueray’s subject matter where easily recognizable objects—trucks, roads, buildings, factory towers—are rendered through strategies of perceptual estrangement, defamiliarization, and subtle abstraction. Indeed, the cosmology that Gueray creates in his paintings, the viewer soon realizes, resembles our own world in only the most superficial of ways: skies exist, but are anything but blue; houses, our symbol of security, are fitted with tires and cannons for some perilous Arcardian road trip; hybrid monster trucks, truly monstrous, have grown mouths and are seemingly ravenous with hunger. Underlying Gueray’s unsettling creations is a sly sense of social commentary that locates dark comedic import in the absurdities and contradictions of everyday life. 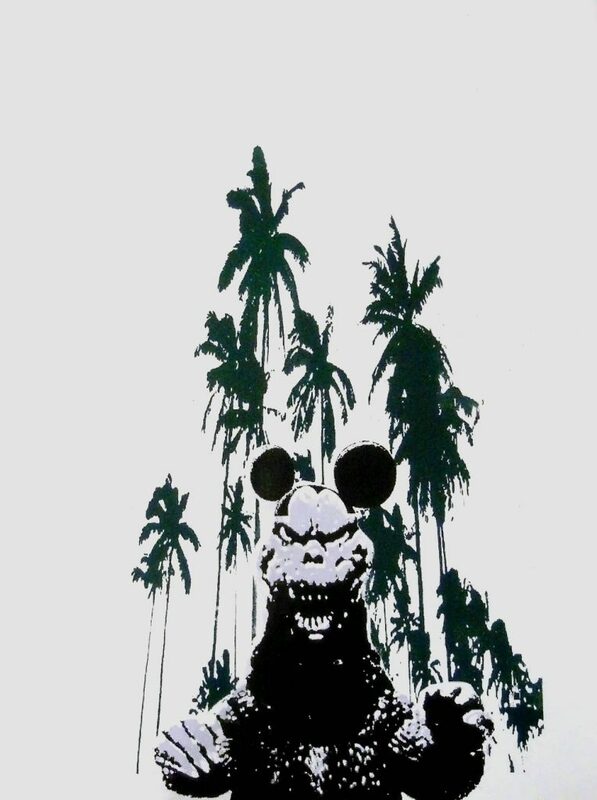 The terse iconography of pop culture, media spectacle, competition culture and consumerism becomes both a point of fascination and critique for the artist. The connotations of progress, adventure, success, and leisure evoked by his depictions—utopian architecture, weapons, travel, luxury items and disposable toys—take on a decidedly apocalyptic tone. Indeed, in spite of the colourful fields and playful imagery of his paintings, or perhaps because of it, a palpable mood of impending doom or wayward violence surfaces. In Guerary’s paintings, the governing systems of reason and ideals of progress by which we largely define ourselves become sites of conflict. His paintings give shape to our common pursuits of beauty, safety, happiness, financial and personal success, while pointing out the ideological dead ends that drive many of our collective dreams and goals. In contrast, Dana Holst presents twelve small drawings and two paintings from her series “Prey” (2008-09) that take hunting as a central motif. 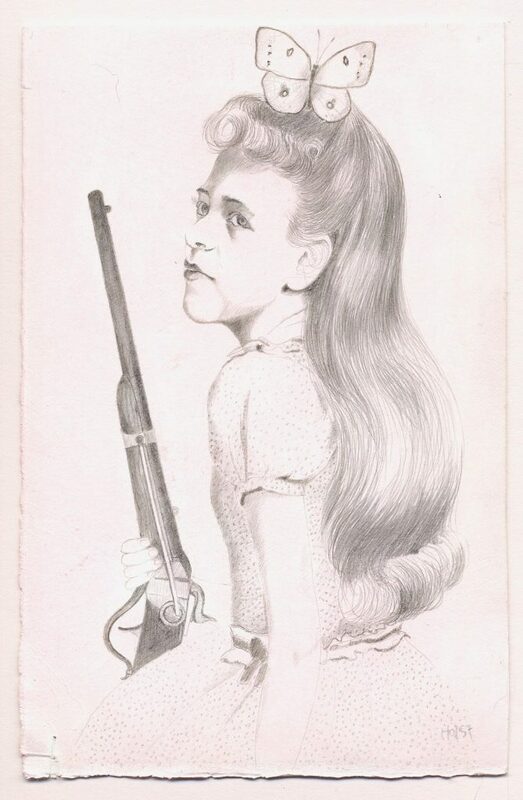 In each of these works, one or two serious-looking girls (with the exception of a brief interlude by Cupid) are shown in their frilly Sunday best sporting an unlikely arsenal of revolvers, muskets and hunting rifles. Posed next to their hunting trophies—both cute and ferocious specimens of nature—Holst’s young protagonists display a disarming sense of confidence that defies expectations of their age and gender. Their aloof, stone-cold expressions suggest a darker impulse to their chosen hobby than mere food, sustenance, or even sport. These girls, at once preened to societal expectation and strongly independent, are as much predator as prey. Rendered in pencil and silver point, and framed in recycled vintage frames, Holst’s delicate drawings evoke visual comparisons to the field of illustration and its various carnations: story books, school books and magazines; children’s notebooks and framed family drawings. Referencing these typically “low art” sources, Holst’s deliberately small, unmonumental works yield a pervading sense of unease and dramatic tension in light of the brooding nature of the imagery: the artist’s choice of medium, size, and presentation contributes to the tension, giving the viewer an impression that these works are perhaps drawn from inside the children’s world they represent. The artist’s engagement with the history of drawing, its connotations of childhood development and its egalitarian access, adds to the creepy nature of these drawings, as if they not only are showing a story, but like some sort of documentary, also telling one. The ODD Gallery is grateful for the support, dedication, and compelling work of Ufuk Gueray and Dana Holst for the success of this exhibition. Many thanks to the ODD Gallery committee, both past and present, who originally conceived of this exhibition and supported its development and execution: Janice Cliff, Michael Edwards, Megan Graham, Tim Jones, Jen Laliberte, Rian Lougheed-Smith, Kyla MacArthur, Evelyn Pollock, Evan Rensch, Byrun Shandler, Dan Sokolowski, Cari Tangedal, Veronica Verkley and Rachel Wiegers.